Here's a great new online slots game from Iron Dog Studio which you can play. Do you dare to explore the deepest parts of the Egyptian pyramids? Thousands of explorers and scientists have dreamed of unlocking Egyptian secrets since the discovery of their ancient life. Your dream of entering the innermost chambers of the pyramids to discover long lost secrets and hidden tombs is about to come true. In this Vegas slots games called Treasure of Horus, you’re going to reignite your love of exploration and spark your curiosity as you dive into the gameplay. This game is one of the greatest works from the Iron Dog Studio. These developers have a deep passion for each of their creations and it’s easy to tell with each of their games you play. Their aim is to give a heart to the game such that it’s more than just reels and slots, but an experience for each player. If you love promo's, check out Slotsbaby today. 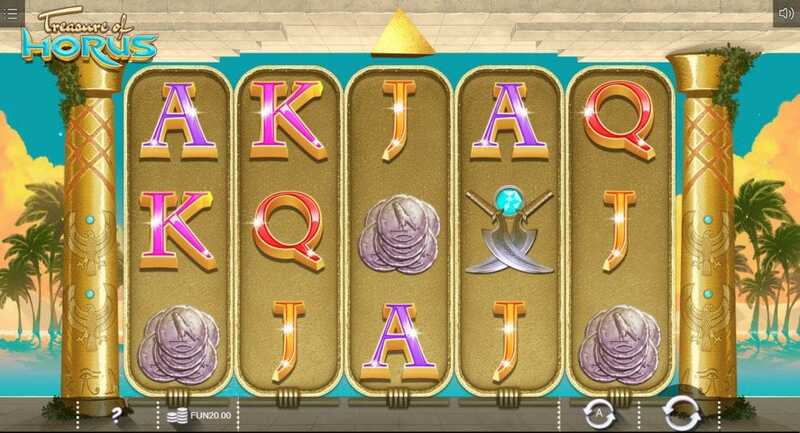 This Egyptian themed slot features symbols of Egyptian culture like desert motifs, hieroglyphics, Egyptian markings-gods and goddesses, etc., to give players that ancient feel. The background is also a warm sandstone color to go with the desert and Egyptian theme. Players will get a true taste of old Egypt as they delve into this 3 row, 5 reel slot and find the treasures of the Egyptian Gods. Weret, Anubis and Horus will reward all the brave with free spins, scarabs, scatters and wilds. This slot game has a 3 x 5 layout with up to 20 paylines. Punters can earn prizes by matching winning symbols across the reels. Basic symbols are the well-known poker ranks so it’s easy for first timers to grasp the game from the go. More thematic icons like cats, coins, swords, ankhs, etc., have larger payouts earning players up to 600 credits when you hit five in a row. With the free spins bonus, players can enter three chambers and find even more hidden treasures. Wild symbol- The wild symbol here is the scarab. Known for their terrifying nature, here all they do is multiply your winnings. The scarabs fly across the screen randomly, but they’ll likely appear at the bottom first and then float on one or more reels. If it is able to complete a winning payline, it’ll drop wild symbols which can substitute any figure. Scatter symbol- Players must be brave enough to enter the tomb of Horus, where they’ll be rewarded for their courage with scatter symbols. Free spins- Who doesn’t love free spins? Aim to land on the Anubis symbol on your third reel to get here. When the Anubis god shows, players earn six free spins within the Anubis chamber. You can earn more spins if you manage to hit the Weret emblem in the middle of the reel. This leads you to another special chamber, the Weret chamber where more wilds with a 2x multiplier await you. The streak of free spins continues with the Horus icon which earns you bonuses and wilds with a 5x multiplier. You can also find the Pharaoh scatter symbols now, which will earn you hundreds of coins if you can hit three or more. This game will definitely take you a journey through history as well as pay you for it. Are you ready to go exploring? Get your bets and gear ready as you dive deeper and deeper into the tombs of Horus. This online slot game will ensure you are seized with adventure from the start.